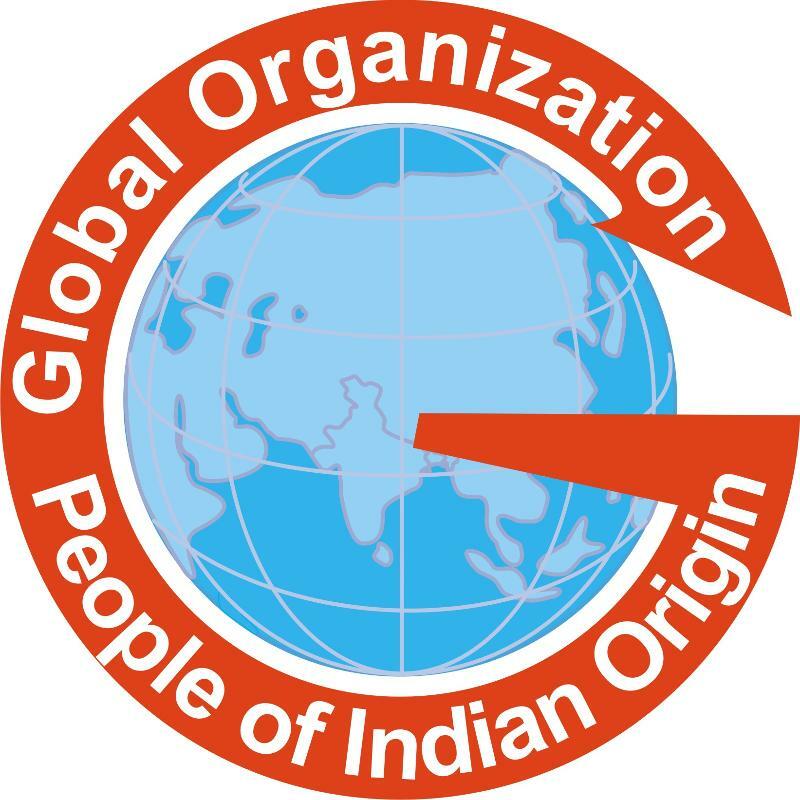 The Global Organization of People of Indian Origin (GOPIO) is hosting its convention on 5th and 6th of January, 2017 at Hotel Le Meridien, Bengaluru in conjunction with Pravasi Bharatiya Divas conducted by the Ministry of External Affairs, Government of India. This convention in Bengaluru attracts investors, political functionaries, business leaders from India and abroad and would be an important milestone which will chart out a course of action for the future. GOPIO, founded in New York in 1989, has been serving the 30 million global Indian community for the last 27 years. GOPIO serves as an effective platform to channel NRI/PIO talents and investments to India their motherland. Over the years, GOPIO has taken up issues of civil rights and human rights violations of the Indian Diaspora around the world and are pleased to say that our communities have joined the political mainstream in many of the Diaspora countries. The philanthropic and social causes undertaken by GOPIO among the needy and distressed NRIs and PIOs are acclaimed by one and all. GOPIO will have its Executive Council and General Body Meetings followed by a session on major issues and prospects of the Indian Diaspora community (NRIs/PIOs). The convention will be formally inaugurated by Union Minister of State for External Affairs Shri. M.J. Akbar. On 6th starting at 10.00 a.m., five sessions will be held on Indian Women, Rural Development, GOPIO Intl Chamber of Commerce, Opportunities in Start-up/Make in India and Digital and India, Start-up Pichathon and Diaspora Direct Investment.The formal part of the convention will end with a Valedictory Session and Excellence Awards Starting at 7 p.m.,GOPIO Community Service Awards will be presented at the Finale Banquet event. GOPIO GLOBAL CONVENTION 2017. BANGALORE. It is with great pleasure we invite you to the GOPIO Global Convention 2017. Sri. Noel Lal, Exec. 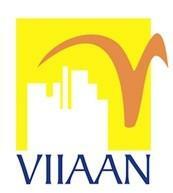 VP, GOPIO Intl. 10.00 am - 11.00 am Session 1 - Indian Women. Global Living. 11.00 am - 12.00 noon Session 2 - Representing Indian Capabilities for the Rural and Under Privileged. Sri. Thomas Mattackal, Industrialist, New Jersey, USA. An Introduction to GICC - A new beginning for GOPIO. Sri. 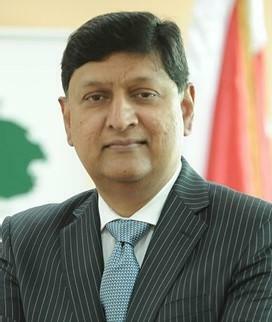 Niraj P. Baxi, President, GOPIO Intl. Dr. Thomas Abraham, Chairman, GOPIO Intl. 2.00 pm - 2.30 pm Session 4 - Startup India. Make in India to Digital India. Indian Startup Eco System is the World's 3rd largest & fastest growing. 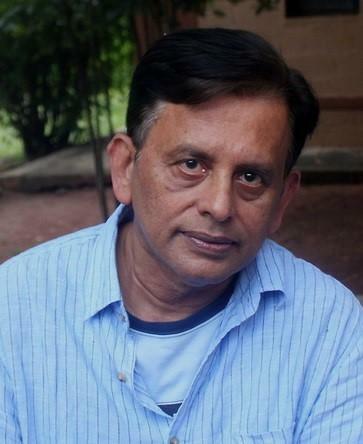 Abraham M. George is engaged in several social projects including: Shanti Bhavan Residential School (www.shantibhavanonline.org) for children from socially and economically disadvantaged families; Indian Institute of Journalism & New Media (IIJNM - www.iijnm.org); Baldev Medical & Community Center to address the healthcare needs of over 15 villages in Tamil Nadu and Karnataka. 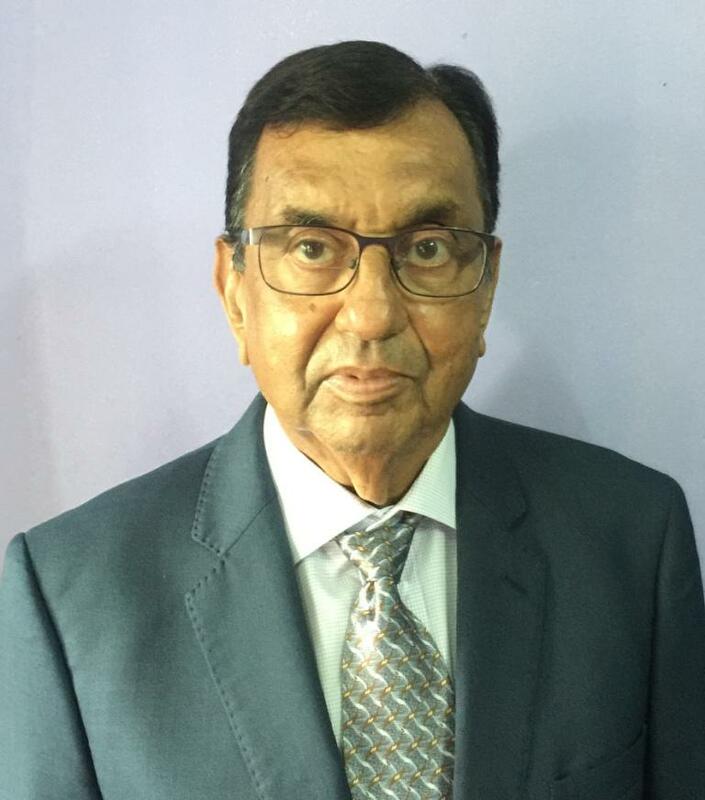 His work in the field of environmental health was instrumental for the removal of lead from gasoline tin India in 2000 and the creation of National Referral Centre for Lead Poisoning. George is the author of four books in international finance and environment. His recent book was "India Untouched: The forgotten face of rural poverty. Chandu Patel has set up the Sabarkantha Health and Research Foundation (SHRF) to augment the state's healthcare system. He started Krishna General Hospital in Himatnagar and plans to upgrade it to a medical college. The SHRF has also set up Geeta Girls Hostel for 300 college students and C. K. Patel Mahila Arts College. Chandu has also contributed to projects for abandoned children, senior citizens and other marginalized sections of society. His donations helped the victims of the Gujarat earthquake (2001), the Odisha super cyclone (1999) and other natural disasters. Chandu has been bestowed with many honors and awards for his community service and philanthropy. After a 25 year career in Neonatology that spanned 3 continents, for the last 7 years Dr. Cherian has taken leadership of the American Mission Hospital in Bahrain. The hospital has been providing high quality care regardless of the ability to pay for the last 120 years. The Indian migrants who cannot afford insurance for healthcare have largely been the beneficiaries of hospital's policy. A sustainable model of financing to provide this care has been created to enable us to grow and expand our reach. This model of not for profit care can be modeled in all economies of scale in both developed and developing economies. Jay is currently employed as group head (home care) for Amka, a major toiletry and household company in South Africa. He has been with Amka for 28 years. He studied marketing and sales at various business institutions in South Africa. He has been involved in various community and charity drives within South Africa. He is very passionate about the plight of women and has worked on training women and placing them in employment. He is currently setting up a training academy where abused and unemployed women will be trained and employed. Dr. Ram Buxani is a 3 time Forbes awardee. He is the Chairman of the ITL-Cosmos Group, a diversified global business entity. He is a visionary entrepreneur, endowed with unfailing business acumen. His autobiography "Taking the High Road", is now in its second edition. 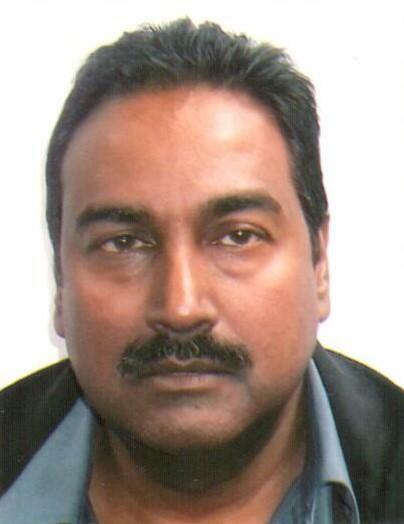 He is often recognized as Mr. NRI in Gulf Region. Truly multi-faceted, he is a community leader, spokesperson of NRIs, writer, theatre actor, cultural ambassador and social organizer. He has been conferred the Doctorate by Washington International University in 2004 and D.Litt Degree by D.Y. Patil University of Mumbai - for his contribution for NRIs and victims of natural calamity. 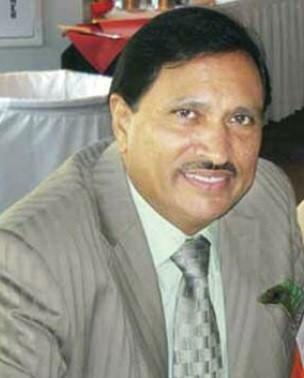 Vinod Chandra Patel has served Town and District of Ba as a Councillor and Mayor and as an elected Member of Parliament of Fiji on two occasions. His contributions have been in the field of Education, Sports, Religion, Community Health, Local Government, and National Government and in Community and Philanthropy. He has provided outstanding service to business and commerce and in the field of sports especially in Soccer as the National Team Director and Vice President. He is the recipient of several awards given by the Government of Fiji and Sanatan Dharam Pratinidhi Sabha. His philanthropic contribution to education in Fiji and India are legendary. Convention Registration: Please register for the GOPIO Convention which includes the Welcome Dinner on Jan. 5th and Lunch and Finale Awards Banquet on Jan. 6th. The registration fee is $35 per person. Registration for youth and young professional - Gratis. Register by sending an e-mail to George Varghese at geevarghis@gmail.com. For more information, contact: GOPIO Global Ambassador Sunny Kulathakal in India at 09845756692, e-mail: kulathakal44@gmail.com or Convention Convener Shaji Baby John at 09567471111, E-mail: shajibabyjohn@kingsgroup.co.in. GOPIO's General body Meeting on June 26th, 2016 adopted a constitutional amendment to launch GOPIO International Chamber of Commerce (GICC). It will be a worldwide body working within the GOPIO organization. The new Executive Council is business oriented and keenly interested to connect with businesses with India and across the world. The new chamber GICC will focus on some of Indian Prime Minister's initiatives such as Make in India, Skill India and Digital India. With our 80 chapters in 30 countries, name recognition and with our extensive level of contacts, GOPIO hopes to grow this new chamber as a globally networked business promotion group. 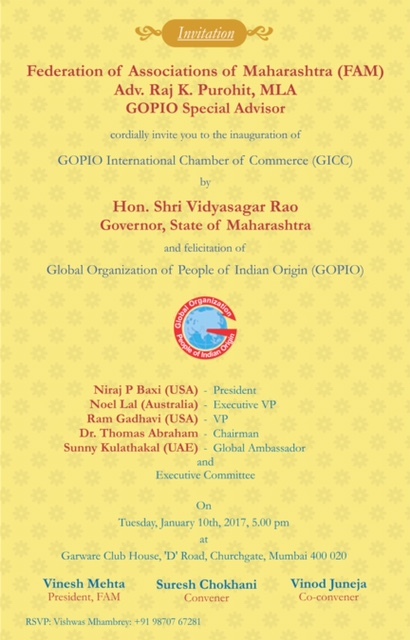 The new chamber of commerce will be launched in Mumbai at Garware Club in Mumbai on January 10th at 5 p.m. GOPIO's advisor Raj Purohit MLA is the chairman of GICC Launch Committee. Chief Guest is Maharashtra Governor Shri Vidyasagar Rao. Many other dignitaries from Mumbai including several political leaders and head of corporate houses will participate. GICC unites will be started in all cities and regions of the world. GOPIO is looking for thoise intgererested and those who whown leadership in such chambers activities before. For information and participation in the chamber, contact gopio@optonline.net. RSVP for the function, contact: 09870767281. The Ministry of External Affairs (MEA) will organize the 14th Pravasi Bharatiya Divas (PBD) from January 7-9, 2017 in Bengaluru, Kranataka, India. It will be inaugurated by Prime Minister Narendra Modi on January 8. The President of India will deliver the valedictory address on January 9 and also confer the Pravasi Bhartiya Samman Awards. The pre-conference seminars will also be organized on January 7 followed by plenary and panels sessions beginning on January 8. PBD has become a significant forum to connect the overseas Indians from all over the world and the PBD-2017 will be focusing on more connectivity with overseas Indians with a theme "Redefining Engagement with Indian Diaspora." Karnataka will be the Partner State of the 14th PBD, which would provide the Diaspora an opportunity to understand the vibrant culture as well as the business and investment potential of the State. 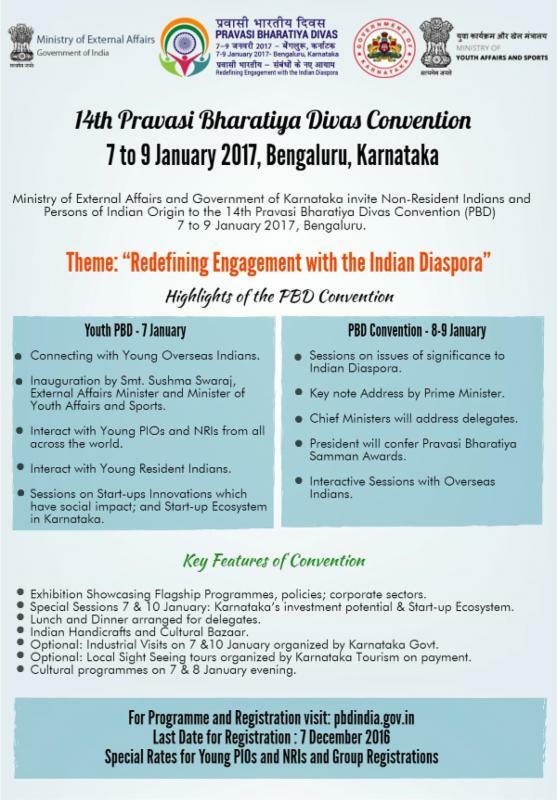 More than 2000 delegates are expected to participate in PBD-2017 from all over the world. Please see more details below or at https://pbdindia.gov.in/. The Ministry of External Affairs has approved discount registration by GOPIO delegates to PBD2017 at 50% rate of $125. GOPIO will make a lump sum payment for all those registered through GOPIO International. GOPIO-Delhi/NCR was successfully launched at a function at the India International Center on Dec. 23rd. More details will follow in the upcoming GOPIOI-News. To becoem a memebr or participate in the chapter, contact Chapter President and GOPIO Life Member Dhiraj Ahuja, 09717112272, globallinkoverseas@yahoo.co.in. To become a Life member of GOPIO, visit http://www.gopio.net/gopio_membership.html, print and fill up the form and send it with a check to:. GOPIO International, PO Box 1413, Stamford, CT 06904, USA.